Whether you are in charge of managing a small construction project, a large building remodel, or anything in between, you probably know that managing a project of any size can be a challenge in our hectic and fast-paced modern world. There are over 729,000 construction companies in the US, and they’ve all got jobs and crews to manage every day, as best they can. The good news is that as the modern world marches on, technology keeps pace to help manage what matters to you. There are many tech-savvy strategies to help anyone managing a construction site or project, and one of the most cutting-edge strategies is remote project management. Implementing remote management technologies can ease stress, limit confusion, save money, and increase efficiency and effectiveness at your project site. Live Feed Cameras – Modern video cameras can provide high-definition, full-color video feeds for remote management purposes, and video technology lets you “put eyes” on your project, even from a distance. 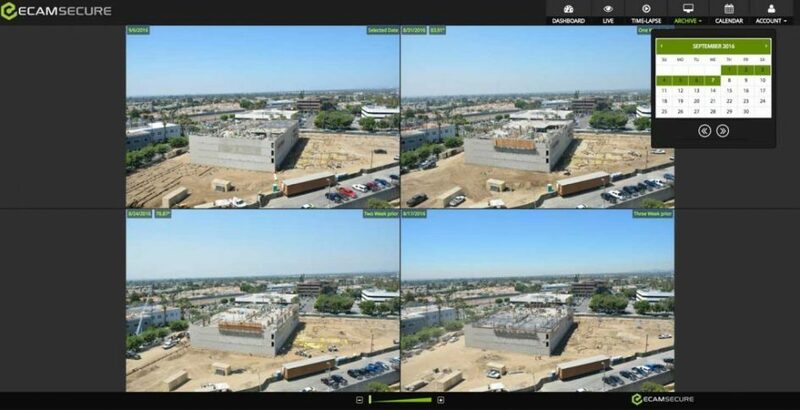 Live feed cameras are specialized to provider silky-smooth, high FPS live video of your project or project site from a remote viewing area, allowing you to have a clear and instantaneous understanding of what’s happening onsite. Video can be accessed from nearly any device, anywhere in the world. Time Lapse Cameras – A modern incarnation of video surveillance techniques that can also be useful in remote management is time lapse technology. Time lapse cameras can provide high-quality video and photographic feeds over any period of time. Those feeds can be viewed and accessed live or recorded to be reviewed later. Time lapse camera technology lends itself to video analytics, and enhanced video feeds with information overlays. Mobile Surveillance Units – Mobile surveillance units (or MSUs) are compact and portable packages of equipment that might include video cameras, alarms, motion detectors, and other high-tech surveillance technology. These MSUs can be deployed singularly or in systems to help monitor even the largest and most vast of construction sites. With an MSU, a manager can remotely observe a site, and even trigger alarms, cameras, sirens, and other surveillance equipment with remote technology. Remote Security Capabilities – One of the most important elements of remote management can be remote security. Modern security systems can be integrated with remote monitoring services that allow you to stay in touch with your project as well as with your project’s security measures. Whether you want to monitor and manage access to gates and door remotely, or activate lights and alarms from a remote location, security systems can be tuned into your remote management needs. There are many benefits to implementing a remote management system to manage your project site, your construction site, or the security of those sites. Site Security – Being able to check in on your project or construction site remotely means an added layer of security is protecting your operation. You’ll be keeping an eye on business yourself whenever you want, and you can even pass off this sort of monitoring to a professional security service that can provide 24 hours a day monitoring, virtual guards, and priority responses to alerts. There’s no better peace of mind than to see things for yourself. Keep on Schedule – Good management will result in better progress toward the project’s end goal, and remote technology will allow any good manager to manage even better. Regardless of the technology implemented, using remote management technology means that the project manager will be able to keep a close tab on the schedule of business and work at a site, and thus be able to keep the project on schedule, every time. Track Deliveries and Shipments – Remote management means that you’ll have a more thorough view and comprehensive understanding of what goes on in regard to every element of a project, and that includes the tracking of deliveries and shipments. With remote management methods, you can work with integrated access control technology, video monitoring, and other tools to keep careful tabs on what comes and goes from your project or work site. Document Progress – The technology you use to remotely manage your site will also help you in documenting and demonstrating progress at the project. This can help you in your own decision making and planning, and it can also be used as proof of progress to investors, stakeholders, and community members. Even better, a well-documented project is easier to market and promote to the public.